It took a long time before we delivered the previous update (2.0.2). Our goal now is to start providing updates in shorter intervals. This update, 2.0.4 alias Fiskarsinjoki, introduces quite a few new features and bug fixes. One of the key new features is the option to save pictures and videos directly from the camera to the memory card. This helps to keep the Phone Memory from getting cluttered and in good shape. Another long-awaited new feature being introduced is conference calling. You can now rotate the device to landscape in Calculator to access the new scientific mode with support for high-precision, brackets and trigonometric and exponential operations. And, you can use Gallery edit options to adjust brightness and contrast of photos. You can also launch the synchronization of Calendar in the app itself, and share files from the File manager of Storage page (in Settings). Last but not least, we have upgraded the Browser engine. 2016-10-19: 2.0.4.14 Early access release #2. Fixed memory leaks in Tracker and call creation with Bluetooth car kit. 2016-10-24: 2.0.4.14 Roll out to Jolla 1, Jolla C and Jolla Tablet. This list contains examples of new features (and some bug fixes) added to SailfishOS since the 2.0.2 release. HERE WeGo app (formerly known as Here maps app) updated in Jolla Store. Credentials of Jolla account dropped from backup data because the access token is used to identify the device in Jolla Store backend. Restoring the backup to different devices would then cause confusion. [Aqua Fish] Origami, Party, Sailing and Work included in the preloaded customer content. Bluetooth headset works now during Skype calls (https://together.jolla.com/question/137336/lte-with-jolla-c/ ). [JollaC] Keyboard click volume reduction. We have made the utility more robust. It should work reliably with different SD cards now, and allow spaces in filenames. Reliability of Bluetooth audio operations with car audio systems improved. Browser engine updated to Gecko 38, a major leap in terms of Browser app. Youtube full screen mode works correctly now. Small corrections to rendering web page content. Added possibility to trigger synchronization manually from calendar pull menu. A line showing current time added to day view. Remorse timer added to events opened from alarm dialog. Fixed issues of calendar widget in events view not showing. Turn device to landscape in Calculator app to access the new scientific mode with support for high-precision, brackets and operations like sin, cos, tan, log, !, square and power. Make picture names more unique by adding also time to the filename, so that pictures from different devices would not clash when uploading to a cloud service. Re-opening Camera starts it in viewfinder mode. Camera application in the background goes back to viewfinder mode after some time. Saving creation time and date to EXIF data of photos fixed (https://together.jolla.com/question/110063/creation-date-not-saved-in-photo-exif-metadata-11928/ ). Settings overlay doesn't hide when clicking inside button column. Developer mode now includes libraries needed to debug and profile C++ and QML application code with Sailfish SDK. Document can be zoomed more due to partial rendering capability - contributed by Damien Caliste among bug fixes. More information about attachments shown, for instance to avoid downloading big ones over slow connections. Document picker is no longer limited to documents in Documents folder, but e.g. also shows documents downloaded with Browser to Downloads folder. Fix to ensure successfully entering the sleep mode between sync sessions. Gallery editing options allow adjusting brightness and contrast of the photo. Gallery editing now supports multiple picture formats (e.g. PNG, BMP, etc.) and not only JPG. Notification highlight made work correctly. Ensure that Power key locks the screen also when applied right after a phone call. Usability improvements and some other fixes to Kazakh, Czech, Finnish, Swedish, Norwegian, Portuguese, Spanish, French and Danish keyboards. Issue with paste button popup on split keyboard fixed. [Aqua Fish, Jolla C] FM radio now supports automatic channel scan. [Aqua Fish, Jolla C] Speaker mode for FM radio. Indexing of FLAC audio files fixed ( https://together.jolla.com/question/127355/2017-flac-indexing-broken/ ). Improvements to opening various MMS attachments. Notes now returns to the text view correctly after changing text color of a new note. Support for conference calls added. Issue of battery draining in flight mode fixed ( https://together.jolla.com/question/141303/flight-mode-problem-with-both-jolla-1-and-jolla-c/ ). Setting all Silica options correctly while changing emulator mode. Added page to Settings to show the system certificates. Mobile electronic signature (mobile certificate) fixed (https://together.jolla.com/question/140298/mobile-electronic-signature-on-aurajoki-20248/). Use nonprivileged filesystem operations - when performing actions in the file manager, they are performed as the plain nemo user without extra privileges, to prevent accidental deletions or overwrites. [Jolla C, Aqua Fish] CVE-2015-1196, CVE-2014-9637, CVE-2015-1396, CVE-2015-1395 (patch, iproute). [Jolla C, Aqua Fish] CVE-2013-7421, CVE-2014-4171, CVE-2014-5206, CVE-2014-5207, CVE-2014-7825, CVE-2014-7826, CVE-2014-7970, CVE-2014-7975, CVE-2014-8086, CVE-2014-8160, CVE-2014-8559, CVE-2014-9529, CVE-2014-9644, CVE-2016-2059, CVE-2016-2061, CVE-2016-2062, CVE-2016-2064, CVE-2016-2065, CVE-2016-2066, CVE-2016-2067, CVE-2016-2068 (kernel). Allow opening respective app for different disk usage categories: launch Store to uninstall apps, Gallery to delete photos or videos, Media app to delete music, Documents to delete documents, open Downloads folder to remove downloads, and so on. Android and Harbour disk usage categories are no longer counted twice in Storage settings figures. File manager can be opened already during disk usage calculations. Share files from file manager. Allow items in the Transfers list to be individually removed. Fix for SIM card names in PIN dialog (dual-SIM device). Fix for PIN query in case of dual-SIM device. Support (I/O level) for writing to SIM card added. Call Forwarding status flag(s) can be written to SIM card ( https://together.jolla.com/question/46929/displaying-the-call-forwardings/ ). Issue with Startup Wizard language selection not becoming active before second boot fixed. Editing a picture (in Gallery) of aspect ratio 4:3 on Jolla1 tends to crash the app. Please use ratio 16:9 for now (change in Settings > Apps > Camera). Will be fixed to the next release. We recommend taking a backup of your data before seeking for OS update. This is because the backup option in the Sailfish OS update dialog tends to stall in some cases (after which the device must be rebooted). Backup works okay if initiated from Settings > Backup. In any case, make sure there is plenty of space in the card. Backup/restore can fail if jolla-email is not installed, due to an invalid assumption in the restore code. If you have difficulty in restoring a previous backup, please ensure that jolla-email is installed, and try again. If you have multiple Jolla C devices and backed them up to a cloud service, then in this case it may be difficult to select the wanted backup to be restored. Consider deleting the unwanted backups from the cloud (or moving them to another cloud folder temporarily) and then try again to restore. Very rarely Jolla tablet fails to boot to the home screen after update. Workaround it is to reboot the device. Rarely the pulley menu gets stuck on Jolla. Workaround is to swipe to enter home, and then go back to app and now the pulley menu should work again. Currently the backup and restore operations are limited to the size of the /tmp partition, which is typically around 1GB when empty. If this condition is not met, the backup operation creates an erroneous backup, or the restore operation fails to restore the backup correctly. A fix is underway for this, but in the meantime, you can clear the contents of /tmp before doing a backup or restore to maximize the available space. Do it easily in Settings > Utilities > Clear backup storage. If you have very large files that cannot be well compressed (e.g. videos) or a sizeable collection of large files (e.g. photos) that will cause the /tmp limit to be exceeded, move these to the memory card or some other off-device location before starting the backup/restore. Note that videos and images are not included in cloud-based backups so this is predominantly an issue for memory card backup/restore operations. Unfortunately the availability depends on each mobile operators. I quess "the package" enters between 5 to 7 pm today as usually. I've noticed I don't even get the EA notification email any more. I've been an 'EA' since the beginning. I've checked my account, I am still opted-in. Weird. @N9Sailfish: How can mobile operators influence the availability of software updates? @Markkyboy: EA of 2.0.4 is not yet out, unfortunately, so no emails have been sent. This ended up with an empty SD/Pictures folder. Just be warned to move photos to a different location. Ahah, thanks for trying, I first moved them keeping the same structure too, imagining that this scenario was too obvious for not having been tested. But since we don't know if there is a QA anymore, I renamed it afterwards. I worth a separate bug report IMO. update without issues. browser is now superfast. thanks ! Hello. What's ETA for a fix of CVE-2016-5195 "Dirty Cow"? Settings>Storage shows the internal memory twice user data and system data. That doesn't make sense. It also shows that "Android files" takes huge space (5.6 out of 6.6GB), which I think is not accurate... All this is a bit confusing indeed. @hoschi: You are right that the issue in the Storage menu of Jolla1 is related to BTRFS. There is no separate partitions for user data and system data on this device. Both of them reserve storage space from the same pool. That is why the Storage menu may look odd. Anyway, it is like intended. Just remove "user data" or "system data", showing both is physically wrong, bascially it tells twice used and twice free space than available. Taken from the screen, my phone has still 16.8 GB of free memory...there are only 16 GB. @jovirkku: technically you are right. But the normal user doesn't know anything about BTRFS and is confused. @hoschi proposal looks good to me. Reported thanks. 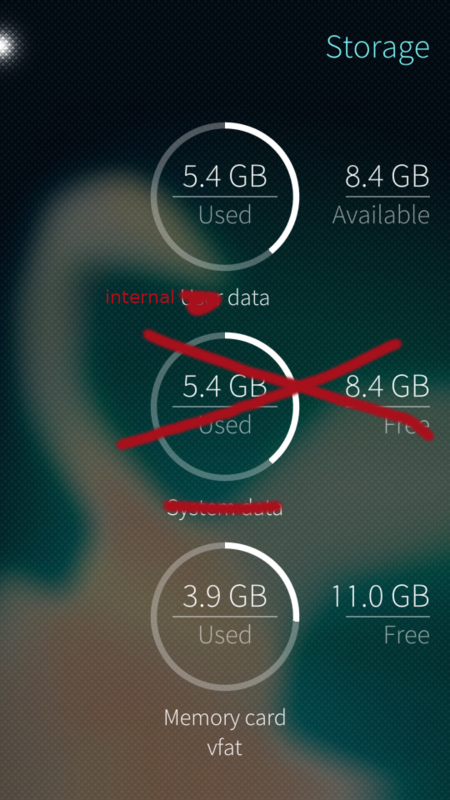 The settings page used to show only one internal partition "mass storage" for Jolla 1. This is regression caused that went unnoticed before early access. I managed to not make the Update quit on me after about 3% with an "update failed - try again later" disclaimer by resetting the app registry with sailfish utilites - but now it's stuck at 50% for about 40 minutes already. What can I do? Pull the plug and risk a broken OS? I unapplied any patches, disabled some critical openrepos repositories and had about 5.5GB free and a balanced BTRFS. Any clue on what could cause such hickups? Thanks for the massive update! I had the same problem, phone was practically unuseable. Fixed via this link. Which essentially is: Boot the phone into recovery mode, telnet in, start a shell, do mount -o subvolid=0 /dev/mmcblk0p28 /mnt/, go into @home and delete all your large media files, umount /dev/mmcblk0p28. Reboot phone, fixed problem. Was able to optimize and update after that. Thank you for the hint. However the reason was not a lack of space for balancing BTRFS. I managed to update by taking out the battery. Luckily the phone booted and reoffered the update (this time 120mb instead of the full size) It went through properly this time. @p_pahare: Updates to partner devices (like Aqua Fish) are distributed once our partner's quality assurance has approved it. Our aim is to have the public software update available to all devices at the same time. Early access is unfortunately not available for partner devices. @jovirkku - So it's not good to update my AquaFish by ssu re 2.0.X.X && version --dup via commandline for EA? 1) After the update Sailfish Utilities didn't open, I had to uninstall - install it from store. 2) After the update in Store app, going from pulley menu to "My Apps" shows only empty list of apps, how to fix that? Fixing app registry from Sailfish Utilities didn't help. Ok, I got it fixed. I I tried this: https://together.jolla.com/question/105220/since-update-to-117-my-apps-empty-in-jolla-store-app/ and this: https://together.jolla.com/question/7988/problem-with-store-unable-to-install/?answer=37218 but finally after re-entering login information into Jolla account made it to work... It didn't show any errors that I would have had an issue with Jolla account. Thanks, re-entering credentials for my Jolla account worked for me too. My Sailfish Utilities did not open too. Looking in the Jolla Store showed an available update and after closing an reopening Settings they are back in business. Nice to see so much development activity. Is there any chance about some updates like muc/omemo for the xmpp integration? Since this update I am having trouble sending longer sms. I get "Cannot send SMS to (nr)". Sometimes I manage to send it after a lot of retries. This is very annoying! If it has to do with the operator, I'm in Norway and I am using the Telenor network. How long SMS you send? I send regularly 600 character SMS. Maybe this will be bad update for me too? I'm still on 2.0.2.51. Not really sure, but 600-ish sounds about right. Not so sure this is a general problem though, I'd expect a lot more complaints if everybody had this. I am guessing it's something to do with the combination Jolla & Telenor. If you know ho to reproduce this issue it would make sense to create a seperate question to report this. Well, there's this which looks like the same thing, although it is referring to 2.0.2 instead of 2.0.4 (and I've not seen this in 2.0.2). I wasn't aware of that referring to 2.0.2 when I commented there. I have all of this problems since 2.0 and no many hopes on a solution but lets see.